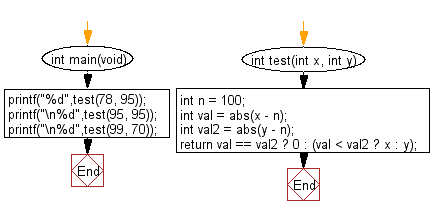 Write a C program to check which number nearest to the value 100 among two given integers. Return 0 if the two numbers are equal. Previous: Write a C program to check whether two given integer values are in the range 20..50 inclusive. Return true if 1 or other is in the said range otherwise false. Next: Write a C program to check whether two given integers are in the range 40..50 inclusive, or they are both in the range 50..60 inclusive.